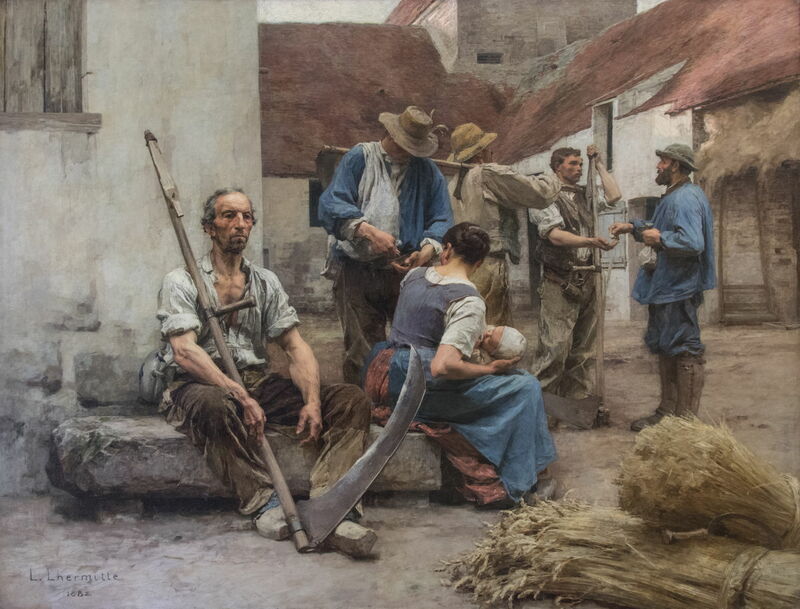 Jules B-L, The Little Chimneysweep (Damvillers) (1883), oil on canvas, 102 x 116 cm, location not known. Wikimedia Commons. 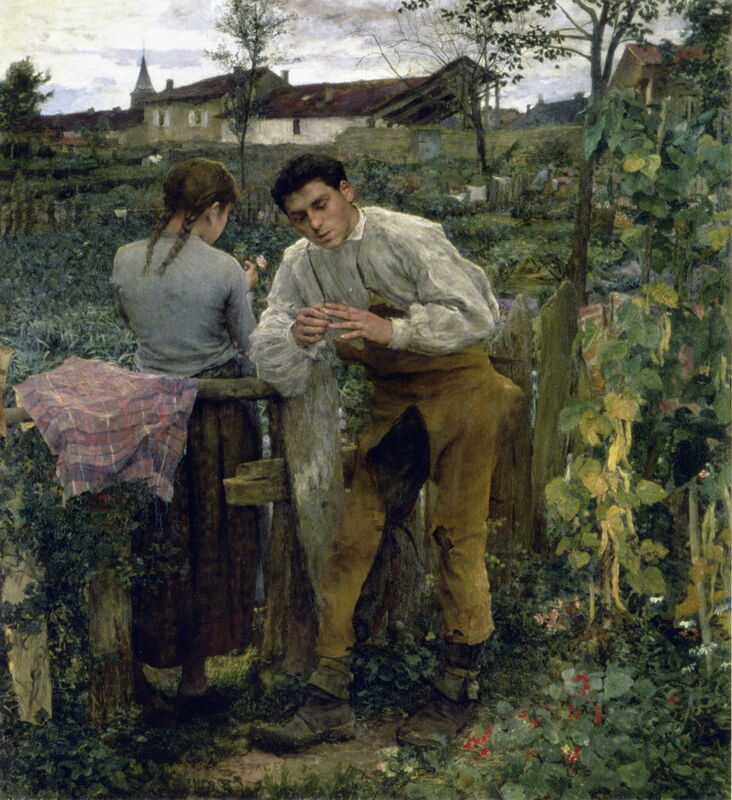 Its dominant influence, until his premature death in 1884, was Jules Bastien-Lepage. Naturalism ultimately originated in genre paintings of the Dutch Golden Age, together with the realism of Gustave Courbet in the mid nineteenth century. 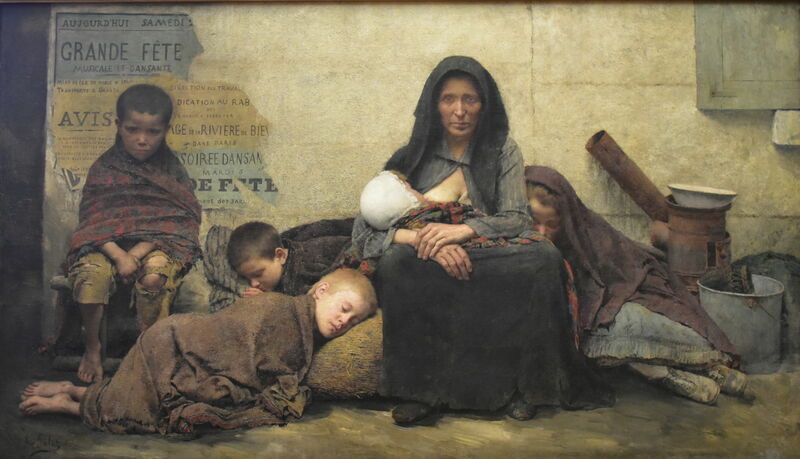 It was Millet who established its starting point in rural poverty, in his paintings during the 1850s. Other more proximate influences include Édouard Manet, and it was Léon Lhermitte who painted the first distinctively Naturalist works around 1880. Naturalism may have developed in France, thanks in part to the Third Republic which formed in the Franco-Prussian War in 1870, but it soon spread through much of Europe. Early adopters were artists from Nordic countries, many of whom worked in France at the time. 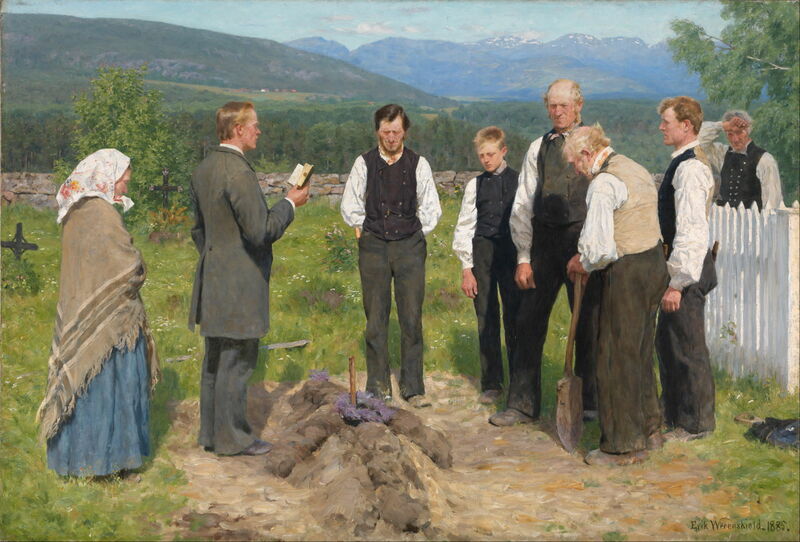 Erik Werenskiold (1855–1938), Peasant Burial (1885), oil on canvas, 102.5 x 150.5 cm, Nasjonalgalleriet, Oslo, Norway. Wikimedia Commons. 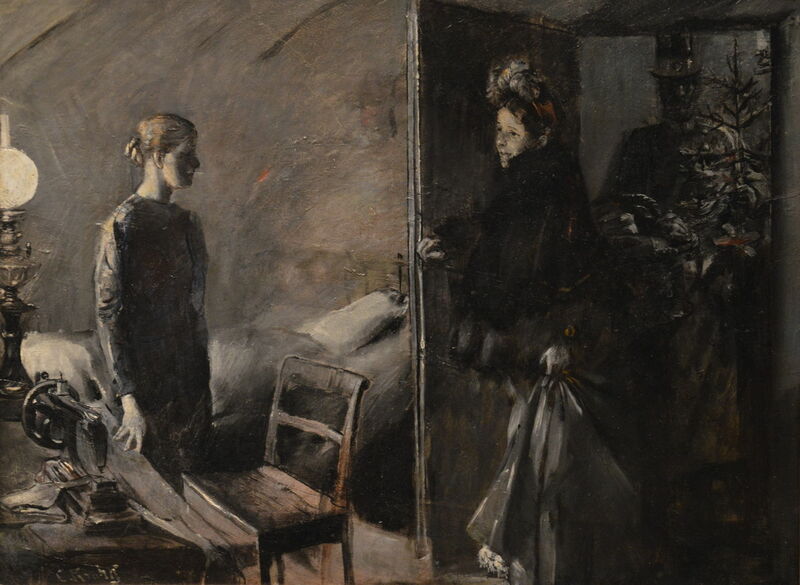 Among the most active of the Nordic artists, who was to remain a Naturalist until his death in 1925, was the Norwegian painter and writer Christian Krohg. Erik Werenskiold’s Naturalist response to Courbet’s Burial at Ornans is another example from the height of the movement in 1885. Quite unlike Impressionism, at that time, Naturalism was enthusiastically supported by the Third Republic, as described so well by Richard Thomson (see reference below). Although many paintings recorded the achievements of the state, some artists drove home social messages which were more critical instead. 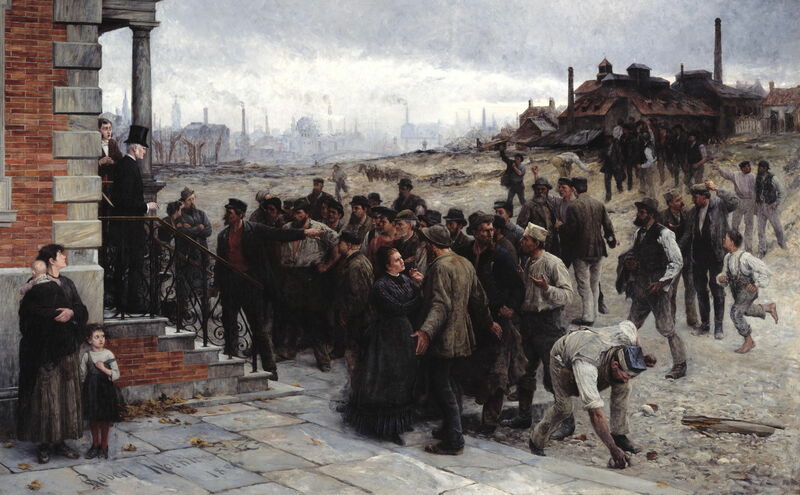 These included coverage by Robert Koehler of the industrial unrest in Belgium, social deprivation in Paris depicted by Fernand Pelez, and campaigns by Christian Krohg against prostitution in Oslo. Many Naturalist paintings proved controversial, and some were purchased by the state so that they could be hidden away from public view in provincial museums. 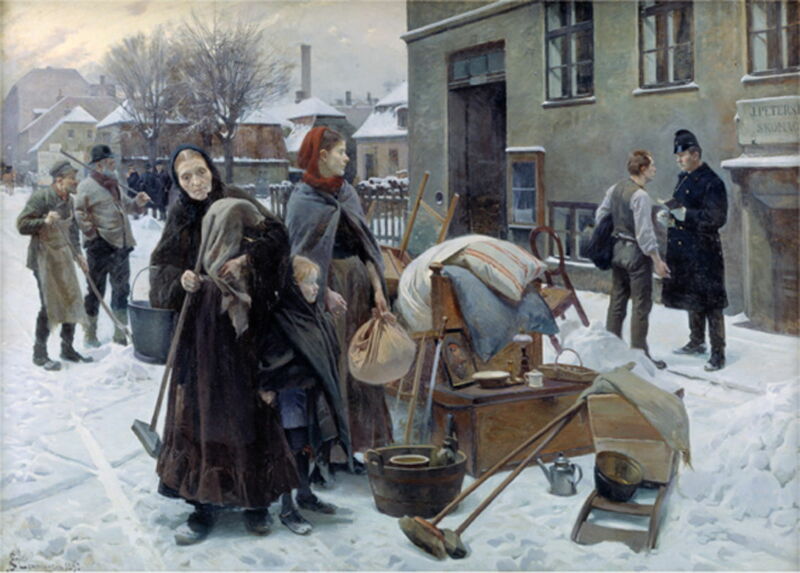 A particularly popular theme in Naturalist painting was urban poverty and other social ills which worsened with the rapid growth of cities and their supporting industries. This was as true in the capitals of the Nordic countries (above) as in the streets of Paris (below). For a couple of decades, painting had acquired new social and political roles. Naturalist painters were as enthralled by the rapid developments in science and technology, as were authors like Zola. 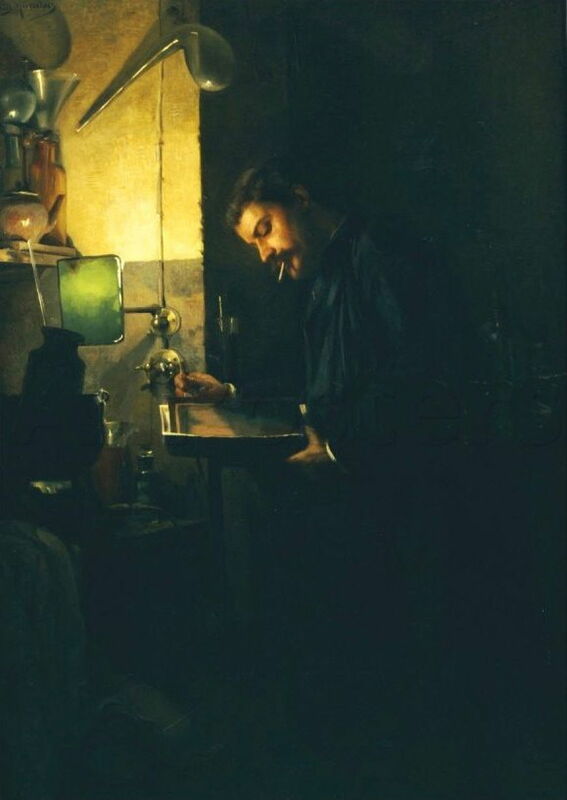 They even celebrated the technology brought with the development of photography, as seen in Louis Muraton’s painting of a photographer developing his plates in a dark room. 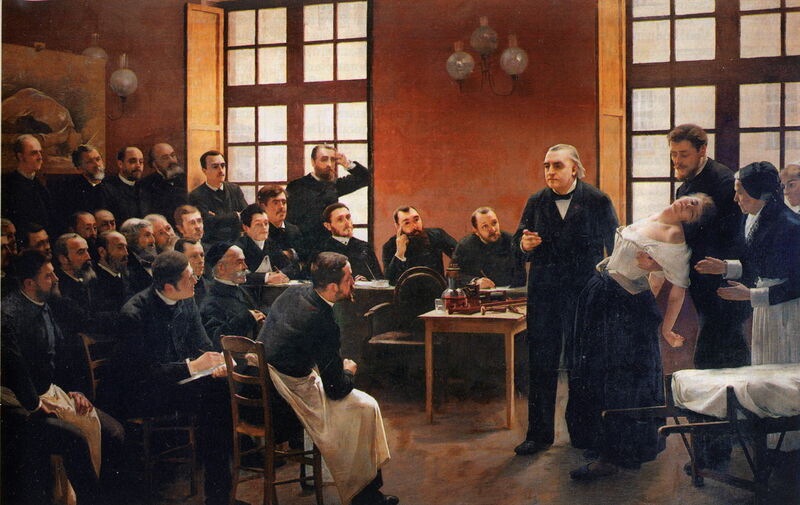 André Brouillet (1857–1914), A Clinical Lesson at The Salpêtrière Hospital (1887), oil, 290 x 430 cm, Paris Descartes University, Paris. Wikimedia Commons. Others recorded the great advances in medicine and its formal teaching. After 1895, there was a rapid movement away from Naturalism. Many of its greatest exponents were old, or had already died, and those who were still active found other motifs and styles. Among the few who continued to paint Naturalist works were Léon Lhermitte in France, and Christian Krohg in Norway. 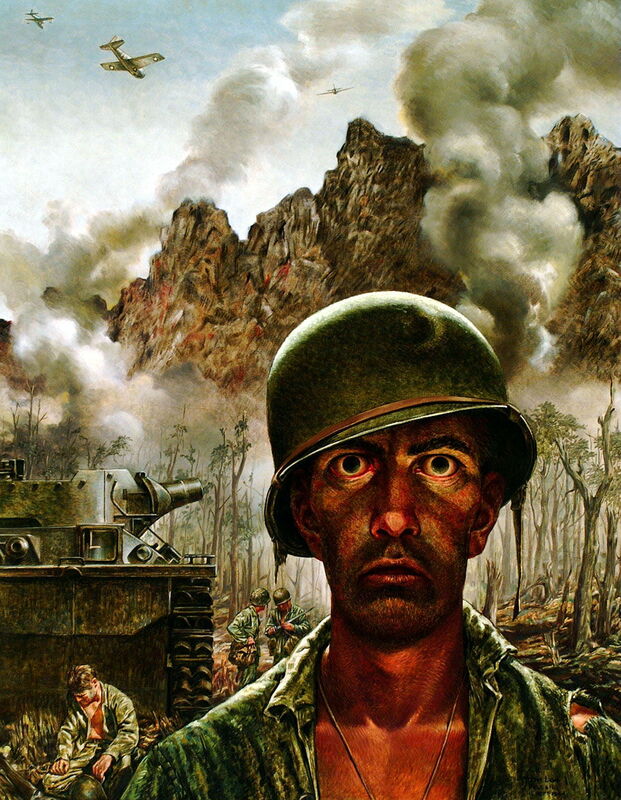 Painting was changing rapidly, and by the early twentieth century realism was left to photography. There is little evidence that Naturalism changed society, although in the Nordic countries it was an influential element in social and political change, with the advent of social democratic movements. A little realist or Naturalist painting survived during the twentieth century, when many were making intensely introspective works which didn’t attempt to depict scenes from the real world. It did influence the altered realities depicted often near-photographically by Surrealists. Perhaps Naturalism’s greatest influence was not in painting, but in the new art of photography. Øystein Sjåstad (2017) Christian Krogh’s Naturalism, U Washington Press. ISBN 978 0 295 74206 9. Richard Thomson (2010) Art of the Actual, Naturalism and Style in Early Third Republic France, 1880-1900, Yale UP. ISBN 978 0 300 17988 0. Gabriel P Weisberg (1992) Beyond Impressionism, The Naturalist Impulse in European Art 1860-1905, Thames & Hudson. ISBN 978 0500 23643 7. Gabriel P Weisberg et al. (2010) Illusions of Reality, Naturalist Painting, Photography, Theatre and Cinema, 1875-1918, Van Gogh Museum et al. ISBN 978 90 6153 941 4. Posted in General, Life, Painting and tagged history of painting, naturalism, painting, photography, realism, Zola. Bookmark the permalink. What a phantastic work! Many, many thanks for your great summary and the deep insight views not only into the painting arts – but also into the human society when these masterpieces of art have been crafted. Please keep on with your good work. Any chance to see you covering the early times of photography as well, Howard? Although I am a keen photographer, and very interested in the history of photography, I’m not (yet) aware of the usable resources. But I will look at Naturalism and photography at some time in the future. I have looked hard, and can’t see any British Naturalists from around that time. I think that Dickens may have been pre-Naturalist, and I’m sure that there were other literary Naturalists later in the century too. What an excellent resource thank you for posting all this. I have been following along somewhat throughout the year, but with this organization I may go through and study it more seriously. Thanks for your hard work! Thank you. I have greatly enjoyed it, and will continue to add to this when I can.